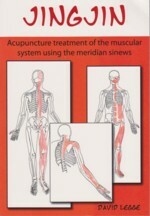 The Jingjin have been translated as tendio-muscular meridians, sinew channels, muscle meridians and meridian sinews. First described in the Nei Jing, they are featured in modern texts but are little used in contemporary acupuncture practice. This publication takes a detailed look at the original material and explires the intentions of its authors in the light of current knowledge. The pathways are re-examined and defined in specific anatomical terms. David Legge is an acupuncturists and osteopath. He has spent more than thirty years specialising in the treatment of musculoskeletal disorder and attempting to make sense of Chinese medicine.